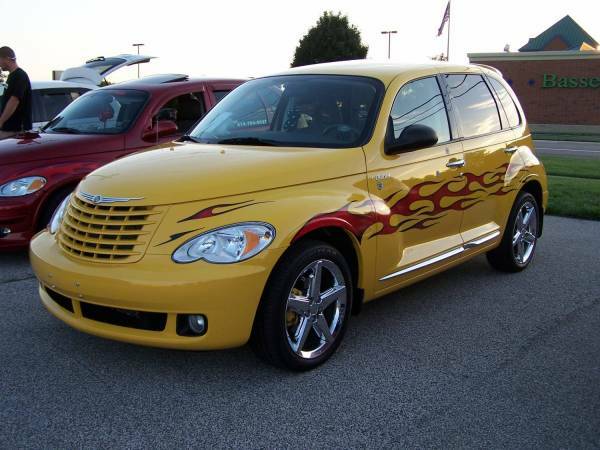 PT CRUISERS CLUB OF SOUTH EAST MICHIGAN WELCOMES YOU ! ptsilver, sanatanadharma, CruiserMike and 2 others like this. Last edited by the3dgm; 24 Nov 2017 at 07:46 pm. Last edited by ptsilver; 16 Nov 2017 at 11:31 pm. I'm a member, although not active, of North Coast Cruisers. I became a member when I had my 03 GT. I was at the Hell, MI show that I believe was Pat Wileys last show. ptsilver, It was good to hear from you. Your input is appreciated. the average PT. We will have a lot to talk about at the next get together. ok if I came by and got that antenna you wanted to sell me ? I know that mine will never be a prize winner but I hope to make it better than it was. My poor pt was neglected but it's on the road to recovery. We don`t have to have show cars, just cars we enjoy and drive. My02RedRide and the3dgm like this. Coming out of a store, Ruth and I ran into a couple getting out of a 02 PT. our information and said we would keep in touch. My phone was home on the charger. everyone wanted to meet, maybe next week or wait till January to meet ? wants to meet somewhere else, I am good with that too. As long as we're not dealing with snow, the Shelby/Washington area is fine with me. A good chance to get you guys some cards.